I used to find resistance training programming to be confusing. It can be infinitely complex; with just a few simple tools, there are literally millions of possible combinations of exercises, sets, repetitions, loading schemes, repetition speeds, rest between sets, etc. Like most complex processes, it helps to break it down into smaller parts and organize it into a system. In this article, I’ll focus on one part of the system, loading schemes. A loading scheme is the loading plan you have for a particular exercise. For example, suppose you are going to do five sets of bench presses. You could simply put on a moderate amount of weight and perform all five sets with that weight (sets across method). Or, you could start with the heaviest weight first, while you are not fatigued, and then reduce the weight on each subsequent set as you get increasingly fatigued (descending or ramping down method). Another option is to start with a lighter weight, and increase the weight on each set, working up to a maximum set with heavy weight (ascending or ramping up method). Of course, there are other loading schemes, and a single exercise may use a combination of these loading schemes. However, the three loading schemes discussed here are all that are really needed, even for an advanced lifter. During my college years, working at Silverback’s Gym and the YMCA, I saw many 400+ pound bench presses and much muscle built using these three loading schemes and nothing more. More complexity is not always better. This is typically done by starting light and going heavier each set (3-5 sets total) and doing the same number of repetitions per set (1-3 reps). Loading is typically heavy (>80% of the one repetition maximum) and rest between sets is long (2-5 minutes). The purpose of this loading scheme is to get some practice attempts with a heavy load in the basic barbell lifts (bench press, squats, deadlift) and the Olympic lifts. The first few sets are essentially warm-up sets. The last two sets are where the work gets done. The lighter weight sets provide some skill practice before the heavy attempts in the final couple of sets. Why is this loading scheme appropriate for heavy load practice for both high-skill lifts like the Olympic lifts and for basic barbell lifts? In both cases it relates to skill practice and specificity. After decades of research, sports scientists have concluded that for power production, specificity is very important. For example, heavier than normal baseballs and bats have failed to produce faster pitches and more bat speed. In fact, they can interfere with those skills by training at slower ball and bat speeds. In the case of Olympic lifts, we are talking about load and repetition speed specificity. The gross motor skills involved with snatching a light weight are similar to snatching a heavy weight, but the fine motor skills are not. That is why for a beginner, who is learning the gross motor skills of the lift, doing lots of snatches with the bar makes sense. However, for an advanced lifter, who is fine tuning the finer motor skills, heavy loading must be performed (specificity). The situation is similar for the basic barbell lifts. It is not because the basic barbell lifts are complicated. The real issue is that when the load gets heavy, more precision is required. Precision = Skill. For example, as simple as it is to perform a bench press, if you get out of the groove by even ¼ inch on a heavy lift, you will miss the lift. In both cases (Olympic lifts and heavy doubles and triples for power lifts), a ramping up loading scheme will allow you to practice the gross motor skills with the lighter weight, and fine tune the finer motor skills as the load gets heavy. 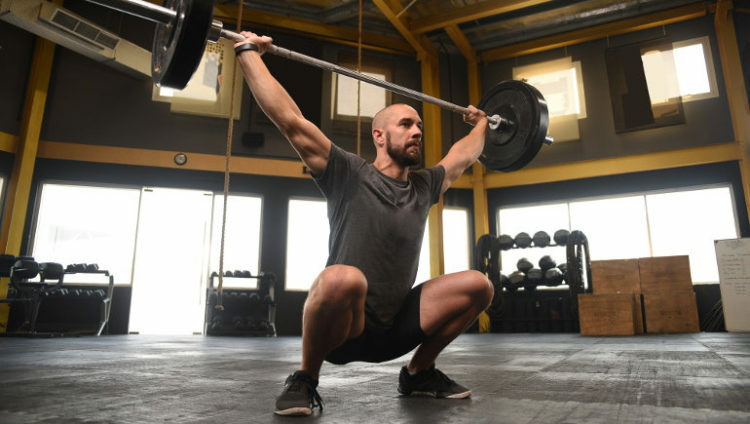 In both cases (Olympic lifts and barbell lifts for heavy doubles and triples) the goal is to work up to some heavy practice repetitions with very little fatigue. Fatigue degrades skill. The long rest periods between sets minimize fatigue and ensures that the lifts can be performed with the maximum amount of skill that we can muster. This repetition scheme is performed by using the same weight for each set and doing the same number of repetitions per set. The loading is moderately heavy (65-85% of the one repetition maximum) for 5-8 repetitions and rest between sets is moderately long (2-4 minutes). The purpose of this loading scheme is to build strength. If done correctly, you are stopping one or two reps shy of failure on each set until the last set, which should be tough. The idea is to load heavy and rest a long time between sets (2-4 minutes). This loading scheme is great for strength because it gives you many quality reps with a reasonably heavy load. 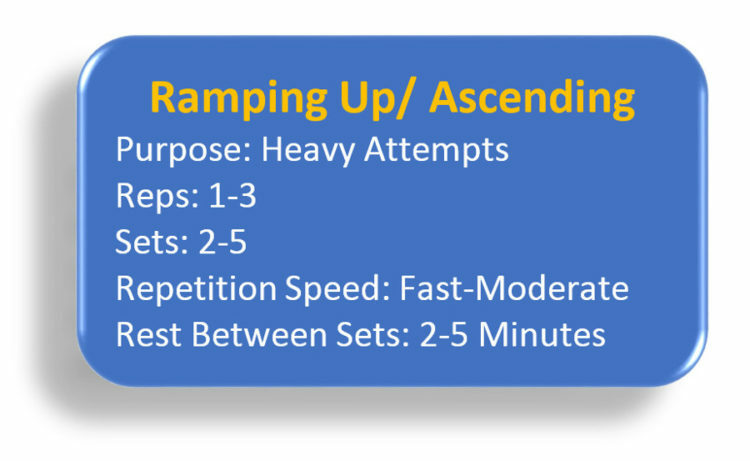 Five sets of five repetitions is the “gold standard” for this type of loading scheme but sets of five to sets of eight have been used effectively. 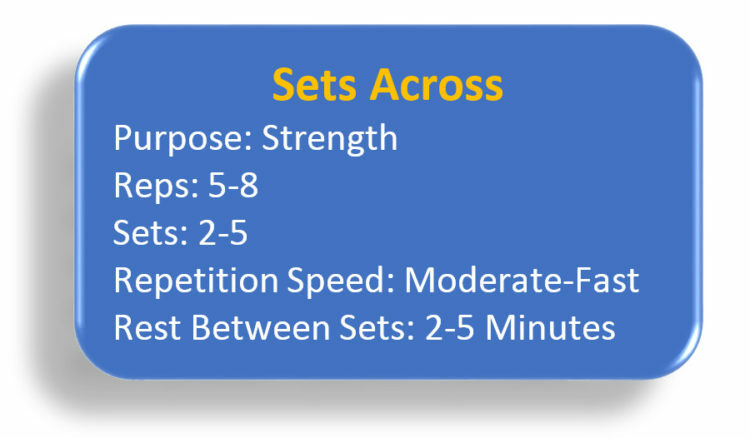 Sets across also helps to prevent overtraining and allows you to progress by “auto regulating.” You increase weight or repetitions (but stay in the 5-8 repetition range) when you can perform all assigned reps (this is auto regulating, increasing when you progress) for all assigned sets. Because this scheme uses moderately heavy loading and high volume, but long rest periods, it provides a nice balance between stimulating hypertrophy and skill training. It allows some fatigue (for hypertrophy) but not enough to severely compromise technique. This is the “bread and butter” for basic strength training. When in doubt, this is almost always a good choice. The descending loading scheme is performed by starting heavy (65-85% of the one repetition maximum) for 8-12 repetitions (higher reps may also work) and go lighter each subsequent set as fatigue develops. Train to failure on some or all sets and rest for about 30 seconds between sets. This is the most intense of the three repetition schemes if done properly because it produces lots of fatigue. The purpose of this loading scheme is muscle hypertrophy (muscle growth) because hypertrophy requires some degree of fatigue stimulus. In the first two loading schemes we discussed we want to minimize fatigue. In the case of descending or ramping down, we want to maximize fatigue, with moderately heavy weight. Because we are encouraging fatigue, repetition speed is slow. The fatigue products (lactate, hydrogen ions, mechanical damage, low energy substrates) seem to stimulate muscle protein synthesis and hypertrophy. 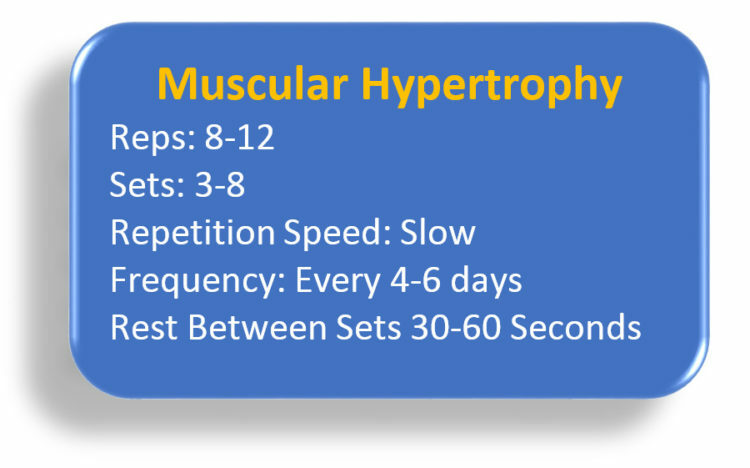 Although 8-12 repetitions has long been considered to be optimal for muscle hypertrophy, recent research has shown that higher repetitions (i.e., 20 repetitions) may also be effective if the repetition speed is slow and if the sets are taken to momentary muscular failure (until you cannot complete a full repetition). Periodization: One final note on how to employ these loading schemes using two types of periodization, linear and non-linear. Both types of periodization are effective, with the handful of studies comparing the two failing to show one superior to the other. Let’s start with linear because it is the simplest. Linear Periodization is simply training for a specific muscle quality (i.e., hypertrophy) for a period of time (weeks or months) and then switching the workout to train for another muscle quality (i.e., strength) for another period of time (weeks or months). Linear periodization is typically used when there is a need to peak for a season or competition (i.e., powerlifters or football players). In this example, we build muscle in the first phase, then increase the strength of the muscle we built in the second phase, then we peak (either power or strength) in the final phase before competition. This is the most logical flow and the most consistently used model for linear periodization. We simply plug in the appropriate loading scheme for each phase. A simple periodization plan similar to the one shown above was very popular in the 90s. It is the type of periodization used by the great Ed Coan and almost all of the powerlifters at Silverback’s Gym, where I worked for four years. 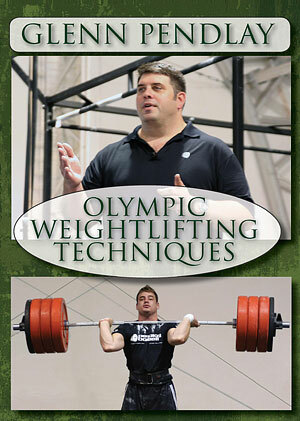 Although it has fallen out of favor with some powerlifters, it is still the primary method used for sports teams. Non-linear Periodization simply means that we are training for more than one quality at a time. For example, our current workout program might include an emphasis on both strength and power. On Monday, we might focus on strength (sets across) and on Friday, power/peaking (ascending sets). There are many ways to do this . . . Some of the currently popular methods are the Texas Method and Conjugate Periodization (Google them). This is the most popular periodization method used by powerlifters today, but it is less favored by sports teams because it requires a high degree of individual customization. As with linear periodization, the quality you are training will determine the appropriate loading scheme. Designing programs can be a struggle for even experienced coaches and personal trainers. 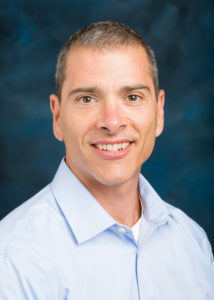 Nick Tumminello excels at making program design simple, from the oldest traditional programming principles to experimental concepts.